Once revered as an essential staple of a balanced diet, cow’s milk is now yesterday’s news as consumers turn to alternative milks from sources like almonds, cashews, peas, oats, coconut and flax for health reasons. The love/hate relationship with cow’s milk is nothing new. The first adverse reaction to cow’s milk was actually detailed some 2,000 years ago. And today, milk allergies and lactose intolerance have reached mainstream levels. Between 30 million and 50 million Americans now report lactose intolerance. 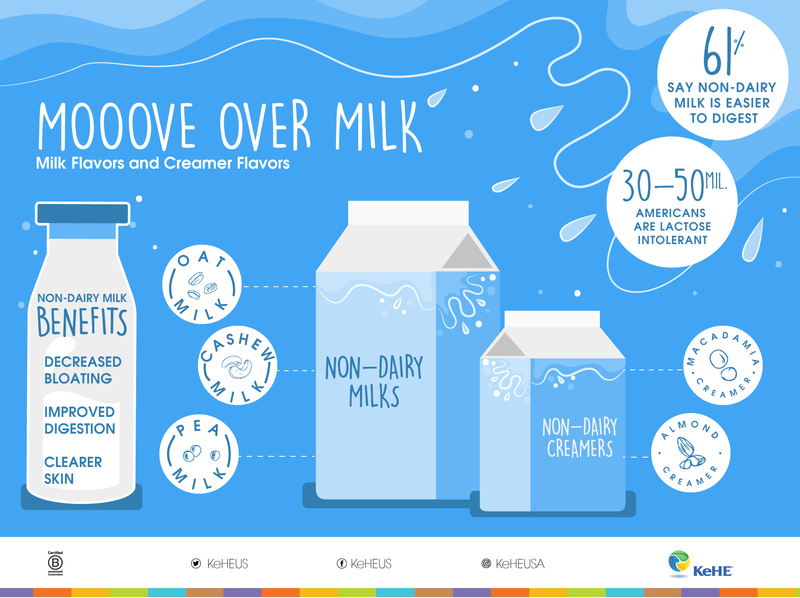 More specifically, 90% of Asian Americans are lactose intolerant, which could mean a larger opportunity for the alternative milk category. The segment is currently the largest in the U.S. and is projected to be the largest immigrant group by 2055. So, it’s not surprising that alternative milks have become a viable substitute for both consumers with heath concerns and those seeking healthier alternatives. And with new options all the time, more and more consumers would recommend them to decrease bloating, improve digestion, promote clearer skin, respiratory health, decrease oxidative stress, as well as offer relief from those allergies and sensitivities that can come with their dairy milk counterparts. The trend has taken the refrigerated and shelf stable alt milk category to sales of $1.8 billion across all channels with 9% YOY growth. And the popularity of these products is poised to continue as manufacturers push the envelope in sources, usage occasions and new taste, flavor and health benefits. Exciting innovation in the category is coming in the form of non-dairy creamers including those prepared “barista style” to give beverages a richer texture. How about a little oat milk with your coffee?